Though new distortion pedals aimed squarely at the metal crowd seem to appear on the market almost daily, having the right pedal won't mean anything—tone-wise—if you don't have the right amp. So, even though there's admittedly no single silver bullet when it comes to metal amps, we've done our best to comb through the market and give you the cream of the crop. In this list, you'll see amps that suit all budgets. From dependable, affordable workhorses from the likes of Marshall, PRS and Orange; to formidable, mid-price standouts from EVH, Peavey and Mesa/Boogie; to the diabolical, high-end Friedman Amplification BE-100 head—there's something here for everyone. Compiled by a group of Guitar World staffers, including Technical Editor Paul Riario, and examined for power, versatility and stage-worthiness, these 10 amps will have you ready to seek and destroy straight out of the box. Versatile and powerful, this amp's sounds range from the cleanest cleans to densely layered high-gain harmonic overtones. Developed in collaboration with Periphery's Misha Mansoor, the Peavy invective .120 amp head is built to fit every need of today's modern progressive metal guitarist. Four JJ 6L6 tubes provide 120 watts of output, while the 6L6s can be swapped for EL34, 6CA7, 6550, KT66 or KT88 tubes for different tonal personalities and performance. Six 12AX7A tubes provide gain for the clean channel and crunch/lead channels (with six gain stages for crunch/lead) and phase inverter and loop driver functions. The included footswitch can control individual channels and functions and provides instant access to nine user-programmable presets or control of an external MIDI device. The invective .120’s tones are familiar but refined in exquisite detail, and range from the cleanest cleans to densely layered high-gain harmonic overtones with percussive attack and tight decay. The amp can push high-gain distortion to extreme levels, yet the sound never gets compressed into mush. With its versatile functions and performance features, the invective .120 is truly one of the best metal amps out there. Amazingly versatile and incredibly aggressive, this is one of the most impressive amps to come along in recent times. The little brother of sorts to the absolutely monstrous EVH 5150III EL34 100-watt head, the EVH 5150III EL34 50-watt head packs the same amazing tones of its 100-watt counterpart into a slightly more manageable package. A pair of JJ EL34 power amp tubes and seven JJ ECC83/12AX7 preamp/effects loop tubes provide 50 watts of output and amazing gain, while the four-switch foot controller allows users to select individual channels and the effects loop with clickless, pop-free performance. Channel 1 provides British-flavored clean tones with ample headroom, Channel 2 delivers the ballsy, classic crunch of Eddie Van Halen’s legendary Marshall Super Lead, heard on the first six Van Halen albums, while Channel 3—with its massive but tightly focused bass—is simply perfect for the modern metal guitarist. The EVH 5150III EL34 100-watt head may be louder, but the 50-watt head hits the power tube distortion sweet spot at lower volume levels. Most guitarists will find the lower levels more appealing for studio applications and gigs in venues where “total annihilation” volume levels aren’t necessary. Amazingly versatile and incredibly aggressive, the EVH 5150III EL34 50-watt head is one of the most impressive amps to come along in recent times. The Mark Five: 35 is perfect for whatever breed of dirt your heart desires. The Mark Five: 35 amp head has two independent channels, each with three modes: Clean, Fat and Crunch on Ch1; MkIIC+, MkIV and Xtreme on Ch2. A 5-band EQ can be selectable per-channel to be on, off or footswitch-enabled. In addition, there are independent, footswitchable Solo level controls for each channel, as well as Reverb and a 35/25/10-watt power option. Sonically, the Mark Five: 35 offers aggressive metal tones in its creamy yet sizzling high-gain settings— all with lots of beating overtones amid string bends—and delightfully malleable sustain and controlled feedback. Vintage, Eighties-style metal comes from Ch2’s absolutely blistering MkIIC+ setting, while a more modern tightness and thump sprouts from the amp when set to Xtreme. But the Mark Series amps have always been more than just shred machines, and judicious gain settings easily straddle classic rock, punk, garage, grunge, or whatever breed of more restrained dirt your heart desires. An affordable amp that packs a hell of a punch. Based on Orange’s popular Rocker 15 Terror, the new Brent Hinds Terror is an impressively versatile 15-watt, two-channel “lunchbox” amp with two EL84 tubes in the power amp section and four 12AX7 tubes for the preamp and effects loop sections. The Natural channel boasts the unembellished sound of the power amp, with a sound that's rich and fat, and perfect for guitarists who use pedals to shape their tone—it’s like the purest white canvas that soaks up every color in vivid detail. The Dirty channel kicks in a three-stage gain circuit and provides greater tone-shaping flexibility through its three-band EQ, Volume and Gain controls. Channels are selected via a front-panel toggle switch or with an optional footswitch that plugs into a ¼-inch jack on the rear panel. A half/full power toggle switch on the front panel selects 7 or 15 watts of output power when the rear-panel bedroom/headroom switch is set to “headroom,” or .5 or 1 watts of output when the “bedroom” setting is engaged. The amp is housed in an all-metal chassis, with Hinds’ signature and face tattoo graphics rendered in orange paint on the front panel. A padded black nylon carrying bag is also included. The 20-watt, two-channel DSL20C comes loaded with a pair of EL34 power tubes and three ECC83 preamp tubes, with a single Celestion Seventy 80 12-inch speaker housed in the semi-open-back cabinet. There are two individually voiced channels—Classic, which delivers a variety of seminal Marshall tones, and Ultra, which straddles a fine line between the beloved Marshall tones of the late Seventies and Eighties and modern high-gain textures. Each boasts its own Gain and Volume knobs, a shared set of EQ controls (treble, middle, bass, presence and resonance) and a reverb level control. Full-(20-watt) and half-power (10-watt) settings are selected via the standby rocker switch, and a Channel Select switch lets users manually change channels when the footswitch controller (which is included with the amp) isn’t connected. A highly versatile amp, the DSL20C delivers various flavors of classic, coveted Marshall tones, but priced low enough for beginners to consider as their first amp. At the same time, it doesn’t skimp on features, making it ideal for more experienced players who crave some Marshall magic in their studio arsenal without robbing funds from their 401Ks. The MT 15 Mark Tremonti is a two-channel “lunchbox” amp powered by a pair of 6L6 output tubes and six 12AX7 preamp tubes. Similar to the PRS Archon, the MT 15 features five gain stages before the Master for full, lush distortion. And while the MT 15 was designed with heavier players—such as the Alter Bridge and Tremonti axeman himself—in mind, the amp offers a range of tones for guitarists working in a variety of styles. The Lead channel offers thick, chunky tones and features controls for Gain, Master, Treble, Middle and Bass, while the Clean Channel is bright and chimey and boasts Volume, Treble, Middle and Bass knobs, as well as a push/pull boost on the Treble knob for a bit of old-school crunch. 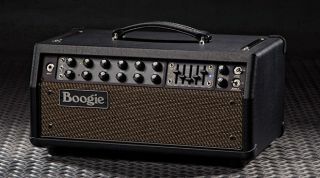 Additional features include an effects loop and bias adjusters that are accessible from the back panel for ease of servicing, as well as a half-power switch that takes the amp from 15 to 7 watts. The compact MT 15 comes in an all-steel chassis with a perforated lid and black-matte finish. Additionally, when powered up, the MT 15’s valves are lit by LEDs which glow red for the Lead channel and blue for the Clean. A striking and very cool aesthetic touch. Other features of the HT Metal 60 include digital reverb with Dark/Bright switch; speaker emulated output with 1x12 and 4x12 voicings; effects loop with effects level switch; and a four-way footswitch (Clean, OD1, OD2, Reverb), all enclosed in an incredibly rugged—and handsome—metal grille. True to its name, the 100-watt Inferno, loaded with four 12AX7 preamp tubes and four EL34s in the power amp section, is built to suit the needs of one of metal's greatest shredders, or guitarists at any level. The two channel, Master Volume amp boasts Lead and Clean circuits, each with their own Bass, Middle, Treble and Volume knobs, as well as individual Gain boost switches. Additionally, the Clean channel features a Bright switch, and the Lead channel a Tone switch and a Noise Gate with threshold adjust when the gain boost is on. The effects loop can be used in serial or parallel modes and is switchable via a foot switch. Speaker outputs may be used at 4, 8 or 16 ohms. Friedman once commented that the Engl team analyzed the tones he accessed on other models in the company’s line, including the Engl Special Edition, Powerball, Steve Morse Signature and Invader amps, to craft the myriad sounds offered in his signature head. And indeed, the Inferno is a wide-ranging and incredibly powerful monster of an amp. A serious tool with the capability to withstand just about anything a guitarist can throw at it. An updated version of the most successful model in Hughes & Kettner's TubeMeister range, the GrandMeister 40 Deluxe is a serious tool with the capability to withstand just about anything a guitarist can throw at it. The GrandMeister has a smart steel case and Perspex control panel featuring nine knobs and a big four-way rotary voice switch. Aside from the amp's master volume, everything is MIDI-powered. MIDI controls the built-in five-step attenuator, series effects loop, boost voicing and phenomenal built-in digital effects. Of course, you can also edit and store presets to your heart's content. The amp's two American-voiced lead channels have massive amounts of gain—perfect for modern drop-tuned metal—with a wonderfully sculpted top-end that squeals and snarls on demand. The built-in noise gate does a nice job of eliminating the hiss on higher gain settings and the new, thicker voicings sound equally fantastic with regular single coils and PAF-style humbuckers. The Ultra channel's attack also gets you just about where you need to go for extreme metal. Overall, the Hughes & Kettner GrandMeister 40 Deluxe is a durable, formidable and practically perfect amp. The end-all be-all of classic British metal tones. An absolute beast in every sense of the word, the Friedman Amplification BE-100 head is the end-all be-all of classic British metal tones. Featuring EL34 power tubes and 12AX7 preamp tubes, the BE-100 delivers searing solo tones. Two separate channels and a switchable boost function lets guitarists find the sound they want, while a global presence control, 3-position bright switch, saturation switch, C45 switch and a FAT switch let users further tinker until they get their ideal tone. The 3-position switch on the BE-100's dirty channel lowers a user's gain structure—the highest setting features the amp's original sound, while the lower settings produce incredible vintage tones. A handbuilt powerhouse, the Friedman Amplification BE-100 truly delivers the ultimate modded-Plexi sound.